High acidity comes about through long-term consumption of high-acid foods (especially wheat, sugar, and excess animal protein), as well as stress, negative emotions, chronic dehydration, and several other factors. Cancer cells also produce high amounts of noxious lev-lactic acid, which further lowers the pH of the body and surrounding tissue. This acidic condition places a toxic burden on all bodily systems and helps the tumor grow. This puts the body in a state of crisis as it musters all its available resources to remove or neutralize this excess acid; and, in doing so, it strains the body’s alkaline reserve and leads to a depletion of critical minerals such as calcium, magnesium, and potassium. When your body cells and tissue are acidic (below pH of 7.0), they lose their ability to exchange oxygen, and cancer cells are able to thrive. On the other hand, when your body cells and tissue are alkaline (above pH of 7.0) cancer cells find it difficult to survive because of the high amount of oxygen present. Alkaline tissue holds 20 times more oxygen than does acidic tissue and this oxygen-rich environment prevents further cancer cell growth. a) Consuming ample amounts of food and drink containing dex-lactic acid (i.e., dextro-rotatory or right-turning lactic acid) which neutralizes the lev-lactic acid (i.e., levo-rotatory or left-turning lactic acid) produced by cancerous cells. Such food and drink would include sauerkraut (and especially sauerkraut juice), buttermilk, cottage cheese, kombucha tea), etc. As an integral part of her program, Dr. Budwig recommended drinking a cup of sauerkraut juice every morning (as a way to neutralize this excess lev-lactic acid). b) Taking a therapeutic dose of Pleo-Sanuvis for five weeks (and perhaps a maintenance doses afterwards). Pleo-Sanuvis is a homeopathic dex-lactic acid preparation. d) Taking full-scale alkalizing supplements such as ionic trace minerals (found in a product called Alka-trace); and/or taking specific calcium alkalizers, such as calcium hydroxide. (The least expensive form of calcium hydroxide is Mrs. Wages Pickling Lime, which can be gotten for a few dollars per pound. For full effectiveness, this must be combined with brewer's yeast.) A very informative book written on ways to alkalize the body using calcium hydroxide and other supportive substances can be found in The Calcium Kit by Dr. Beddoe. Taking high-alkaline substances such as potassium bicarbonate, sodium bicarbonate, calcium hydroxide, or cesium chloride can raise cellular pH but these substances should be used in conjunction with a healthy and alkalizing diet, and with other alkalizing strategies that include supplementing with magnesium (particularly in the form of magnesium chloride). A short program of high intensity "burn" exercise, engaged in twice a day, is also helpful, as this kind of exercise prompts the body to produce its own dex-lactic acid (which helps neutralize the lev-lactic acid produced by a tumor). Lev-lactic acid (which is optically left-turning) repels oxygen and ensures that the cancer cells are able to thrive is an aerobic environment. Dex-lactic acid (which is optically right-turning) is naturally produced by the body to draw oxygen. Hence, when the muscles cells are exerted, and need more oxygen than the blood can supply, they put forth dex-lactic acid to attract more oxygen. One's pH levels can be determined by using a simple pH strip and measuring the pH of the urine and the saliva two hours after eating. The average pH of the urine and saliva (which is derived by taking the urine pH + the saliva pH and dividing by two) should be around 6.4, which is slightly acidic. (The body produces acid in its normal processes and needs to "throw off" excess acid in order to maintain a slightly alkaline state. So, the urine and pH should be slightly acidic, which indicates that your cells are slightly alkaline.) There is some debate among natural doctors as to what pH is optimal. Since cellular pH is optimally around 7.3, some people believe that the saliva/urine pH should also have a baseline reading of 7.3 but, as mentioned, this one-for-one logic may not be correct. According to the research of Cary Reams, a baseline pH of 6.4 is optimal and that is why I am suggesting this number as well. "So why is it that an overly-acidic environment in the body is also a low-oxygen environment? The answer to this question is somewhat detailed on a biochemistry level, but basically is it because all acidic conditions consists of excess hydrogen ions. In the absence of sufficient minerals to neutralize this acidity, the body must combine these excess hydrogen ions with any oxygen that is available, thereby creating waster as a harmless byproduct. This, if a person is continually creating an acidic inner environment and the don't have enough alkalizing minerals in reserve from their diet, then their body is constantly having to neutralize their overly acidic state by depleting the body's available oxygen. However, if there are enough alkalizing minerals available for the the body to use first, such as calcium, magnesium, or potassium, then it is not necessary to the oxygen of the body to be used up in order to neutralize the excess hydrogen ions." Dr. A. F. Beddoe's book, The Calcium Kit, outlines a complete program for alkalizing the body using calcium and other supportive products. Listed below is the basic protocol he uses to bring about pH balance. Cancer cells produce lev-lactic acid (i.e., levo-rotatory or left-turning or negative (-) lactic acid). This caustic acid can be neutralized by taking in large amounts of highly alkaline foods and drinks or by neutralizing it with dex-lactic acid. To supply ample amounts of dex-lactic acid, and help neutralize the flood of lev-lactic acid produced by cancer cells, drink at least 1 cup of kombucha or fermented cabbage juice (sauerkraut juice) per day. Best to drink this some time in the morning, on an empty stomach. It is also quite helpful to do a few minutes of “burn” exercise (morning and evening). The burn you feel from this kind of exercise is the body producing beneficial dex-lactic acid (to bring more oxygen into the muscle cells). Taking dex-lactic acid dairy products, such as yogurt or kefir (which is yogurt or kefir made from primarily dex-lactic acid strains) is also helpful. Dex-lactic acid strains include: L. Sporogenes, Lactobacillus Casei, Streptococcus Lactis, Streptococcus thermophilus, Bifidobacterium bifidum or Bifodobacterium longum CKL 1969 (DSM 2054), and Lactobacillus Salivarius. There is no labeling or standardization in regards to the dex-lactic acid content of dairy products in the USA (through certain brands in Europe and Australia certify that their product is at least 95% dex-lactic acid). Another method to neutralize acid (at the cellular level) is to take a five-week course of Pleo-Sanuvis. This is a homeopathic dex-lactic acid preparation that raises the acid level of the blood and correspondingly lowers the acid level of the cells. "A cancer patient always suffers from over-acidification of the tissues. 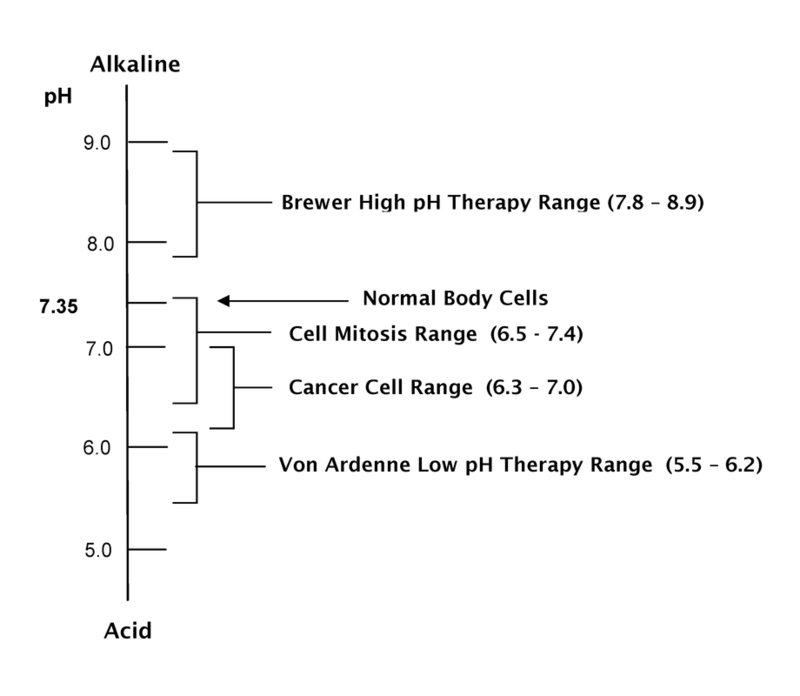 In order to deprive the tumour of a favourable environment, the tissue-pH value must be changed from acid to alkaline. This is easier said than done because all alkaline-forming nutrition loses its intended effect soon after entering the bloodstream, as it is used up in the blood for buffering, before it can reach the tissue. The organism (body) always endeavours via appropriate regulating mechanisms to maintain the blood-pH value at around 7.4, which is absolutely essential for the stability of hormones, in particular adrenaline. A brief recapitulation of the law of reversed proportionality of pH value changes in blood and tissue: if the blood-pH value drops, the tissue-pH value rises (and vice versa). This gives us a kind of lever: it should be possible to indirectly raise an unhealthy acid-tissue-pH value by lowering the slightly alkaline blood-pH value. "Over-acidification of tissue is prevented in a healthy organism (body) by the dextrorotatory lactic acid that is constantly produced by movement and suitable nutrition. This, therefore, indicates that an input of optically dextrorotatory lactic acid is needed. This may seem like a contradiction to the layman, in that tissue is to be de-acidified by administering an acid. The paradox disappears, however, if all interrelations are kept in mind. Acidification of the blood by means of dextrorotatory lactic acid lowers the blood-pH value until it and the tissue-pH value reach the same level. This takes precisely five weeks in cancer patients who are administered an appropriate dose of dextrorotatory lactic acid (thirty drops, three times daily). This has been confirmed time and again by my own measurements over many years of the blood-pH value. "During the period from the first until approximately the fourth day in week 6, the acid substances will be discharged from the tissue into the blood, the pH value of which drops for a short time to very low values. The excretion of the pathological substances of the tissue via blood, liver, kidneys, and skin during this period is apparent from an entirely pungent and acid smell. "The continued supply of dextrorotatory lactic acid finally ensures an unproblematic and physiological restitution and maintenance of a blood-pH value of 7.4 and a tissue –pH value above that figure. This will remove a critical precondition for continued growth of a tumour in a cancer patient, namely the acid environment. Kidneys and liver are now capable of carrying out their full detoxification functions, thereby, laying the foundations for a safe removal of subsequently occurring disintegration products of a malignant tumour. "Finally, dextrorotatory lactic acid also causes the biological neutralization of the toxic, levorotatory lactic acid of the tumour into a non-toxic, racemic form. This is of utmost importance, as it removes the stimulus for an increase in the cell division rate. Normalising the acid-alkali balance also stimulates adrenaline production and improves its effectiveness, an equally important precondition for a healthy (aerobic) metabolism." Self-administering dextro-rotatory lactic acid (Pleo-Sanuvis) is very easy. Simply take 30 drops (1/2 a teaspoon) orally 3 times daily, on an empty stomach. A 100ml bottle will cost around $40 and will last for 2 weeks. In order to restore the acid-alkaline balance, on the cellular level, you will need to follow this protocol for at least 5 weeks (which means you will need to purchase 3 bottles). It's advisable to continue taking Pleo-Sanuvis, at a dose of 1/2 teaspoon per day, thereafter. Or, you can discontinue using Pleo-Sanuvis if you are regularly consuming dex-lactic acid in the form of Kombucha, sauerkraut juice, or dex-lactic acid dairy products such as kefir, yogurt, whey, or sour cream. 1. The first approach is to bring one’s acid-alkalinity levels into balance and promote a state of overall health. Most people are too acidic, which puts a great strain on the body and leads to all kinds of problems down the line. To bring about a state of increased health such a person needs to alkalize through supplements and eating more alkaline foods. 2. The second approach is to shift one’s total alkalinity to abnormally high levels. This is not particularly healthy for the body (but hopefully it will destroy or debilitate the cancer in the meantime). Normal cells are “more advanced” and more adaptable than cancer cells and are able to survive this extreme alkalinity, whereas cancer cells are not. This approach, which shifts the pH of the body into extreme alkalinity, can be accomplished through the high use of sodium bicarbonate (combined with other alkalizing agents, such as sodium and potassium carbonate) or with cesium chloride (as used in the Brewer Protocol). In some ways this approach is similar to the use of paw-paw or Cancell: both of these agents lower the electrical charge of all cells in the body. Normal cells are able to operate at this very low, electrically-starved level, whereas cancer cells, being less adaptable, are not. Thus, at this low energy level cancer cells weaken or die while normal cells survive. 3. The third approach is to use sodium bicarbonate (which is an alkalizing agent) along with a sugar-based carrier (such as maple syrup) to selectively target and kill cancer cells (or the cancer microbe within cancerous cells) with sodium bicarbonate. Cancer cells, which have about 15 times as many glucose receptors as normal cells, quickly gobble up this bicarbonate-laced sugar and are harmed or destroyed by the bicarbonate. It is important to understand the difference between these three approaches because you cannot conveniently combine them all into one. The first approach, which aims to normalize the body’s pH levels—and which is a good first approach in the treatment of all disease, and for overall health—begins with the use of sodium bicarbonate (and potassium bicarbonate if it is available.) This is the easiest way to begin alkalizing the body but it is not the most balanced. After a week or two on this protocol a person should add other alkalizing minerals, such as magnesium and calcium. To supply magnesium, one should use a transdermal application of magnesium chloride (or take drops in liquid, if they can tolerate the taste). To supply calcium, which cannot be readily obtained from food, one should supplement with calcium gluconate and/or calcium citrate (which are neutral calciums in that they do not shift the pH level in any way) and calcium hydroxide which shifts the body pH from acid to alkaline. The second approach, which aims to super-alkaline the body, effectively weakens the body (and the cancer as well), and wildly through off one's potassium levels. Another potential problem is that a person may not take the right dosage and end up alkalizing his or her body a little above normal range (7.4-7.8) but not high enough to reach the high pH or cancer-killing, range. (See chart below.) This approach may be one of the best alternatives for advanced cancers (and to bring about immediate cessation of pain) but it should be done with great care and with expert supervision. The third approach is also a “cancer-killing” approach but it also has the virtue of raising one’s pH toward a normal range. This approach, which relies exclusively on sodium bicarbonate, will eventually throw one’s mineral stores out of balance and that is why it should only be used for a week or two at a time and followed (or used in conjunction with) other alkalizing agents (such as potassium, magnesium, and calcium). The approach to health and healing (and the treatment of cancer) as outlined on this website does not emphasize “cancer-killing” approaches, such as the use of cesium, mega-doses of proteolytic enzymes, anti-cancer herbs (such as paw-paw or graviola), Laetrile (or apricot seeds), or any of the miraculous cancer-killing concoction one may find on the Internet. The emphasis here is on restoring the inherent balance of the body and activating its healing power. Some “cancer-killing” strategies are slightly harmful to the body (but hopefully more harmful to cancer cells) while others are singularly beneficial. Any “cancer-killing” approach that has health-promoting properties—such as the use of cannabis oil, apricot seeds, aloe vera concoctions, ellagic acid (made from raspberry seeds), modified citrus pectin, black walnut tincture, turmeric, etc.—if one feels drawn to it—can be used in conjunction with this program.